Two days ago I posted this blog post about what I called a minor yet significant step by Malaysia Airlines to rebrand by engaging me. I was asked by some people why the email I got has anything to do with the Malaysia Airlines brand. I explained that in the social economy of today where consumers not companies define brands, it is the little things that brands do when interacting with consumers and how those consumers share their thoughts on those experiences, that build strong brands today. I used as an example how much money Malaysia Airlines had spent over the previous 10 years on advertising whilst driving the brand experience into the ground. This meant that the brand had no equity in the bank and that if anything were to go wrong, it may struggle to rebuild its brand. From the outside it looked like management had come to believe that the brand was defined by the company and as long as the company kept creating messages that the management liked, the brand would one day bounce back. And then came the tragic events of 2014. The out of touch management didn’t have a clue how to address the issue and could not engage with relatives and other stakeholders. I compared their reaction to that of Tony Fernandez following the terrible Air Asia Indonesia accident of the same year and how his response was so ‘human’. Following the twin events and with no equity in the bank because few customers were talking positively about their experiences with the brand, Malaysia Airlines had to be bailed out by the government and is still lurching from one problem to another. I explained that whilst the interaction I had with Malaysia Airlines was small it was nevertheless a step in the right direction and if it was part of a strategic plan to start delivering value in key customer facing areas, it was a step in the right direction to save the brand. I went on to explain that brands are not built with a big idea, a creative campaign or a one off interaction. They are built organically, over time and through little interactions at nearly every touchpoint. This isn’t rocket science but it is amazing how many firms still think they can build a brand through a creative programme. And then today I read this article about a Virgin employee who works at San Francisco airport. 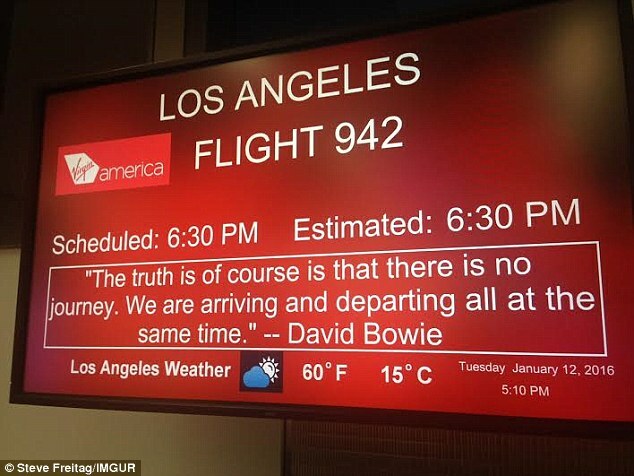 Over the years he has adapted flight information boards to include famous quotes, jokes and irreverent announcements. Rather than discipline the employee Steve Freitag, Virgin actively encourages him to make passengers smile. Passengers who encounter Steve Freitag will envariably talk about the experience and tell their friends. No big idea thought up over a six month period and then turned into a slick advertising campaign. Just a real person doing real things and making life better for a minute for those people flying with Virgin. In the case of my little experience with Malaysia Airlines it meant that instead of clicking my heels and the airport and wasting time I could ill afford to waste, I could spend an extra 45 minutes in the office. And here I am sharing my experience with you through this blog and on Twitter and Facebook. And some of you are sharing my story with your friends. And together we are rebuilding the Malaysia Airlines brand. « Is this the first glimpse of the new Malaysia Airlines brand?